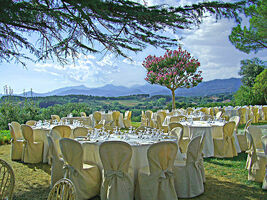 Special Feature: Legally Valid Civil Ceremony can be held both inside and outside the Villa. Imagine your wedding day as a series of relaxed moments outdoors with friends, a glass of good wine in hand and long views of the surrounding vineyards and olive groves? 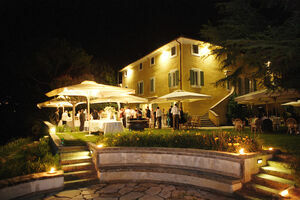 Villa Nicoletta, because of its outstanding location in the heart of Lucca's wine country, Montecarlo, serves up wedding dreams with ease. 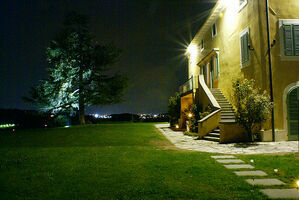 It is one of the few villas to possess the legal decree necessary to hold civil ceremonies on its premises. This means you have the luxury of a legally binding civil ceremony outdoors followed by an outdoor wedding reception on the same premises, keeping transport simple. 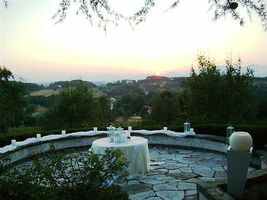 The ceremony takes place under their wisteria covered pergola with sweeping views of the grapevines while cocktails are held on their panoramic rotunda and dinner in their country garden. No worries for rain either, as the entire ceremony and reception can be held indoors in case of inclement weather, so there is a great savings made by avoiding the need for tenting. Although there is no accommodation available at Villa Nicoletta, it is conveniently located less than 500 meters down a charming country road from the Montecarlo Farmhouse, where comfortable accommodation and a great pool awaits you. 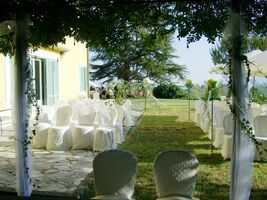 For small wedding parties, Villa Nicoletta can be rented out on weekdays as a civil ceremony-only site and the reception can be held at the Montecarlo Farmhouse's restaurant. 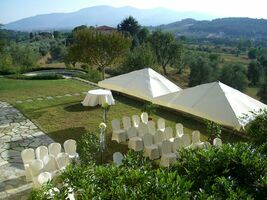 A good solution for intimate wedding parties of 50 people or under, who wish to enjoy the beauty of an outdoor civil ceremony without going through the extra hassle (and cost) of hiring an external catererer.